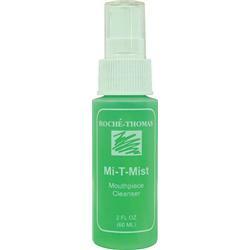 Roche Thomas Mi-T-Mist Mouthpiece Cleaner Mi-T-Mist, a topical antimicrobial, is designed to disinfect the mouthpiece and provide a cleaning refreshing agent that will remove residue build-up from the instrument. Just apply the fine mist spray to the mouthpiece and let evaporate (about 45 seconds). To freshen and clean the inside of the instrument, spray liberally into the instrument and immediately swab. Mi-T-Mist evaporates quickly and assists in eliminating moisture.